That's a pretty good idea and you can decorate a pot like that to match your kitchen. I'm going to give that a try. 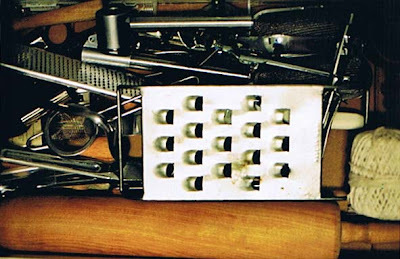 Wow, the ability to keep all your kitchen utensils in a single drawer and such a small area of counter space is really impressive. There are a lot of utensils that can be substituted or done away with, but I still like having extra wooden spoons since they make great baby toys for teething infants.